important story, comprised in PLUMP Chapters 1 & 2.
the greater good, and they find that good in Twiddle. can be found at TwiddleMusic.com. a double disc live album recorded in August of 2013 at Burlington, Vermont’s Nectar’s. 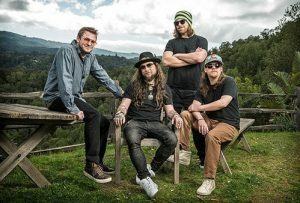 Live at Nectar’s truly captures Twiddle in its element, the live experience. That record was a self-titled collection, released at the end of 2015. The full process of recording the album wound up taking six months, due to the band members’ busy schedules. Carlson was working in Las Vegas full time, and “would drive back to Los Angeles, only on Tuesdays, to work on the record.” Talk about dedication! There’s this undeniable synergy that takes hold when you put on the Organ Freeman debut album. From one funk groove to the next, it’s a toe-tapping odyssey from start to finish. The band’s influences belie their sound, as they cite the tightest of groovers. James Brown, Soulive, Snarky Puppy, Stevie Wonder, Herbie Hancock, Jimmy Smith, D’Angelo are all mentioned at the drop of a hat, showcasing this band’s pure devotion to that in-the-pocket jam. For fans of the Organ Freeman funk, fear not. The band also has a new record in the works, one that will be out “by early 2017” if all goes to plan. The future is bright for Organ Freeman, as they continue to turn heads in a big way. As more artists and fans take note of the band’s style, there’s no limit to their potential. Organ Freeman is an organ trio consisting of; Trevor Steer – Organ, Rob Humphreys – Drums and Erik Carlson – guitars.